Preheat oven to 350F. Lightly grease and flour a 9-inch springform pan. In a small saucepan, brown the butter by cooking it over medium heat until it turns golden, about 5 minutes. Remove from heat and allow to cool to room temperature. In a large bowl, whisk together eggs, egg white, sugar, bourbon and vanilla extract. Whisk in the flour mixture and when it is completely incorporated, whisk in the browned butter. Fold in the apples. Bake for 50 minutes, or until the top of the cake springs back when lightly pressed and the apples are tender. It will be golden brown. Allow cake to cool before adding glaze. Whisk together until smooth. You may have to add extra bourbon to thin it out for drizzling. Just add a little at a time. This makes a cake about 2-1/2 inches high. 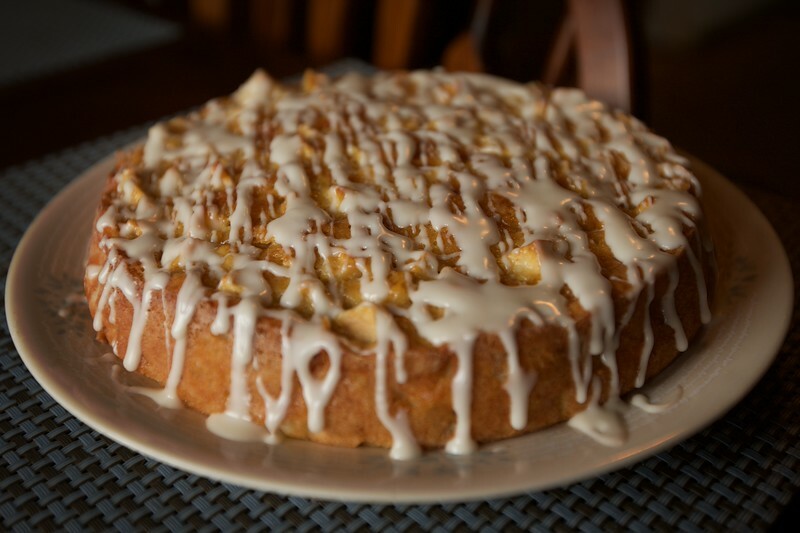 A coffee cake that is BEAUTIFUL and amazing to taste! Love the Apples and Bourbon in it. Nice moist coffee cake. Hubby liked it too!!! !